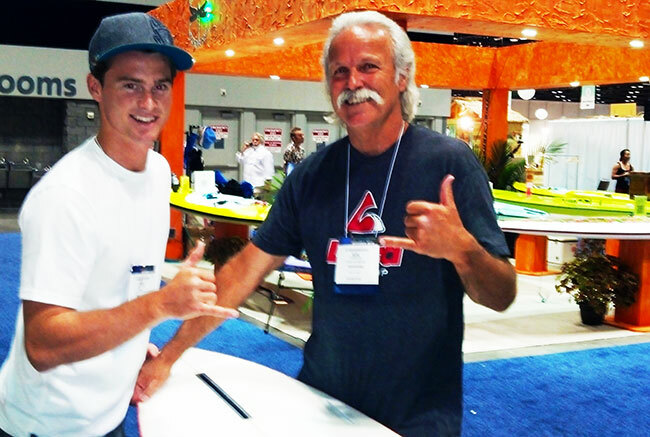 Glimpses from the SURF EXPO where sup was the #1 attraction this past week: Standup World Tour leader Sean Poynter meets Laird’s legendary shaper Bob Pearson of Santa Cruz (holding the Teauhupoo sup gun he made for Laird (12′ x 27″ wide and NOT very thick for the 225lb. Laird); Pearson and Laird have launched their own extensive line of boards under the Nidecker [huge snowboard co.] label; Pearson took time to talk design with Sean and show Poynter his Laird Teahupoo gun… also told Sean how he tests fin placement: “I put 3, 4 or 5 side-fin boxes on the left and right back ends of the test board, fill a backpack with small fins and take ’em to the beach, trying out the various combos forward, back, middle, etc… you’d be surprised what an inch difference make,” says Pearson. Good luck in the final 3 World Tour events, Sean!! and Bob and Laird, good luck with the new venture!